This Friday and Saturday, June 8th and 9th, come celebrate the Grand Opening of Fairport Pharmacy & Coffee in their new location at Whitney Town Center. Visit their full-service pharmacy, meet the experienced staff, and try some delicious freshly-brewed Finger Lakes coffee, hot and cold coffee drinks, tea, smoothies, as well as Amazing Grains featured pastries and salty bread. Originally located at Fairport Village Landing, Fairport Pharmacy and Coffee’s new customized destination at 650 Whitney Road in Fairport was previously home to Rochester Telephone. Whitney Town Center revitalized the building and site into a vibrant plaza and community destination that include locally-owned national and regional businesses. Additional tenants of Whitney Town Center, quickly becoming the retail heart of the affluent community of Fairport, NY include: Eastside Pediatrics, Sweet Charity, Pizza Chef, Zen Nail Spa II, Sew Creative, and I Love Kickboxing. With scheduled openings this fall, Original Steve’s Diner and Ladybugs Play will also be joining the growing community soon! An independently-owned, service-oriented pharmacy, right in heart of Fairport, NY. 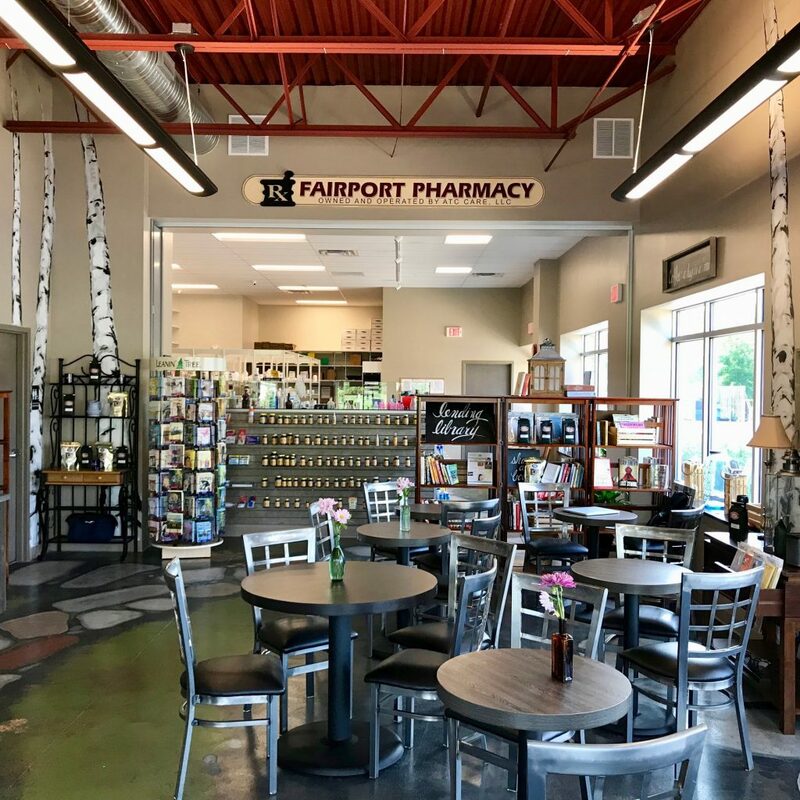 Fairport Pharmacy and Coffee specializes in assisting customers with a focus on individual attention and great service at competitive prices when compared to major chains. Their pharmacists each have over 20 years of experience. With the added convenience of Finger Lakes Coffee Roasters and Amazing Grains products in-house, it is must-stop during your daily routine. Drop-off your prescriptions, or call today: 585-678-4258. The newest place to live, shop and play on the east side! Whitney Town Center in Fairport, NY features 28,500-square-feet of retail space, professional offices and medical services, offering a warm and welcoming neighborhood shopping experience. With a mix of casual dining, service providers and retail shops, along with abundant outdoor recreation areas, there’s something for everyone. For tenant leasing information, please visit www.WhitneyTownCenter.com. With the added convenience of Finger Lakes Coffee Roasters and Amazing Grains products in-house, it is must-stop during your daily routine.